I just heard from Ken Lane's son, Brian. Ken has gone on to be with his heavenly Father. I can't type anymore. I am so so sad. As Ken always said, "have a good little day!" I'm trying, Ken. I'll miss you so much. So very sad. Ken was a good man. "By worrying you can not add one single second to your time on earth. By accepting Christ you can add eternal life after your time on earth." He was a smart guy. He is now with Christ. That makes me sad.....my thoughts are with his family. He will be missed around this old board. A good man, with a big heart ... a lifetime of experiences ... enviable wisdom ... a loving Trina and a little Willie (the dog). Rest in Peace Ken. I'll never forget the sight of the big man walking thru the Sportsmen Show with that tiny little dog. From what little I knew of him, he was a very nice man. All of us hope to be remembered as such. PapaHog was one of the really good guys. Rest in peace, Ken. Never met him, but I asked a question once about tidewater bobber fishing, and he answered my question and asked me to check my schedule so that he could SHOW me his answer. Regrettably, I never had a chance to follow up on his offer, but his words and action spoke volumes about who he was. He said it best. May peace be with his community and especially those who knew him best. We should worry less and live in peace together the best we can while we are here in this life. May he rest in peace. It kinda puts things in perspective, like how minor the traffic accident i was in this afternoon and how I can settle down now. One of the good guys, absolutely. One of the best of guys, unquestionably. Ken was a great guy. He would come in for service and visit me often with his little dog. He will be missed. May you rest in peace in our Lord and Savior's arms My dear friend and Brother. I'll never forget you my friend. Ken was A man among men. I use one of his sayings allot, so in memory of Ken I will continue to use HIS saying "Me Thinks"
Trina, may the Lord and Savior give you peace above all understanding. Grandpa Don, not an old model but a clasic. Life after death is comforting. For his wife, family, and friends! Prayers for his family. He was one of the good ones. Rest in peace Ken, great person and Veteran. He was a super nice guy. That's too bad. godspeed Ken, we all wish you peace. Ken was a good man, he will be missed by many. Ken was the best that Ifish had to offer. Ken was positive in his comments, helpful and considerate to others. I didn't know Ken personally, but I made a point to read his posts, and they always put a smile on my face. 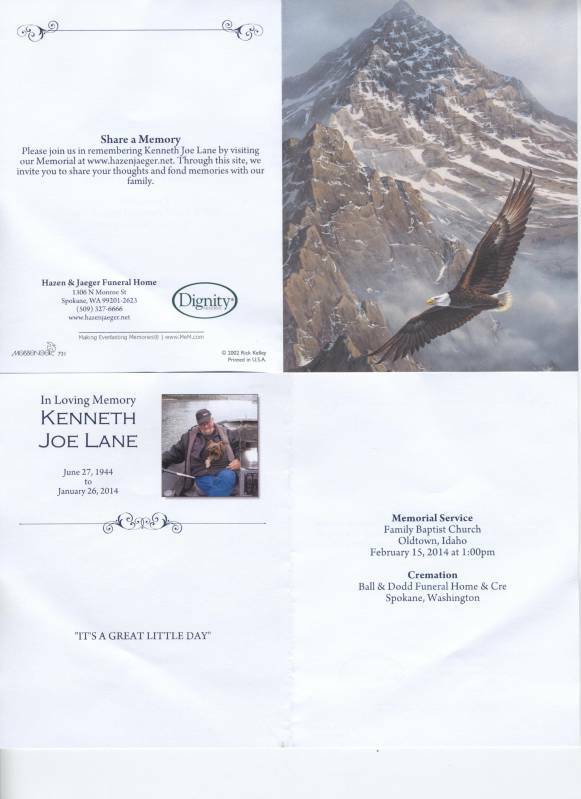 I offer my sincere condolences to Ken's family. I can only imagine what a wonderful individual he was in person, considering that we got to see only a small piece of that big man here on Ifish. Who could forget Papahog barbequing corn at Jennie's Ifishstock parties. He was a happy guy. iFish lost a good man. Rest in peace, Papahog! I love you, Ken. Hugs. Tears. WOW! I'm seeing this thread for the very first time this morning. We've had this thread running over in the Chapel and, if the weather and road conditions improve some by then, my wife and I are planning to attend his memorial service in Oldtown, ID (just outside of his and Trinna's home in Newport, WA - - btw, she does spell her name with two "n"s) next Saturday. 'Best I can recall, it was about 11 - 12 years ago that I first met my friend, Ken. Some ifisher had arranged an ifish get-together for lunch at the Farmstead Restaurant in NE Hillsboro. We've been good friends since then. My prayers are with Brian, Trinna, Willie and all who loved Ken. Ken was a fine gentleman and a gentle-man. Ken was one of the good guys I will miss him! !